Initiative Media, a subsidiary of Interpublic Group, came to TouchGraph requesting a better way to analyze and present Nielsen TV Rating information. Initiative Media was using custom surveys combined with Nielsen ratings to help their clients determine which shows would prove the most cost-effective platforms for their advertising. Initiative Media wanted a more analytical and data-driven approach to identify shows that were the best advertising candidates. They also needed a dynamic and effective way to present the results. 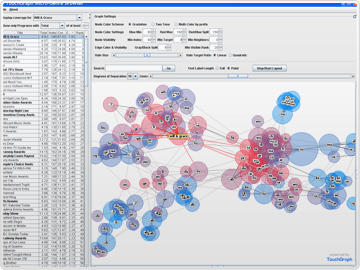 TouchGraph worked with Initiative Media to develop the Micro-Genre Browser, an application that visualizes TV programming as an interactive map. The Micro-Genre Browser interface uses Nielsen survey results to visually reveal the best advertising opportunities. The Browser's clustering algorithms find the natural genres into which TV shows are segmented. The layout and display algorithms of this application were tailored to generate diagrams that look good both on screen and in print as presentation materials. As a result, Initiative Media has been more effective in both identifying and demonstrating buying opportunities to their clients. Their newly data-driven approach has greatly facilitated making recommendations and backing their findings, and their presentation materials have been a hit with their clients. We will show you your data�s potential and bring you a practical visualization solution.